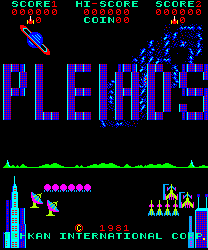 Pleiads is an unofficial sequel to Phoenix from 1980, and is also very similar to Pisces. Basically, it's a Space shoot-em-up game. You must defend your base, and destroy all the alien ships. Advance through the stages to destroy the alien mothership, and then return to earth to start over and defend your world once more. 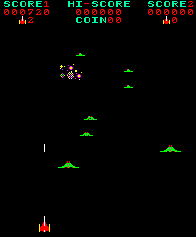 The first stage is set on Earth, and you must move your ship left and right and use your missiles to destroy all the alien ships, avoiding their shots fired at you. Your satellites track the enemy ships and also provide additional firepower when aliens are above them. If the aliens manage to land on the surface they construct shields which block your shots. You can however destroy the shields by shooting at them. Kill all the aliens on the first stage and your ship launches into space, where you have to fight more aliens. These are similar to those found in Pisces and Phoenix and they are the small aliens who grow into large bird-like creatures. You must hit them in the centre to destroy them; shooting their wings only stuns them for a few seconds. The next stage is the alien mothership level. You must destroy all the alien ships launched from the mothership and fire repeatedly at it. Kill all the aliens and you can then destroy the mothership. You must then return to Earth to defend against a new wave of attackers. To get back to your defence position on your home planet, you must weave your way through the formation of static ships without touching any of them. Bonus points are awarded for collecting the flags and upon completion of this section the game then starts over, but harder. Alien with legs: 80 points. Hatched Bird alien: 100-400 points. Destroying the mothership: 0-9600 points. Succesful return to defence position: 500-4000 points. On the return to Earth make small movements, as the more you move continually left or right the faster you move. Try to destroy the bird aliens as soon as possible, or they swoop down at you. Alien ships on the first and mothership stages fire repeatedly when they are directly above your position. Fire ahead of them and move quickly out of range, and they will move into your shots.